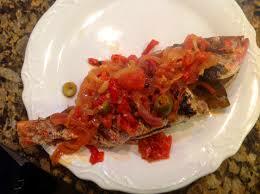 Pescado en Mojo Isleño (Fish in Tomato Olive Sauce) - Tienditadepuertorico.com - Buy Puertorican Food Here!! In a large skillet, heat vegetable oil. Sauté both sides of fish until it gets golden brown. After fish is done, drain oil from pan and pour in mojo isleño. Shredded Fried Green Plantains (Arañas) .